After losing the first set, 6-0, to Williamsport’s Ben Haussmann and Michael LeBlanc, Lewisburg’s duo of Cole Temple and Sawyer Fisher bounced back to earn an 0-6, 6-3, 6-4 victory at No. 2 doubles to help the Green Dragons defeat Williamsport, 3-2, in boys tennis on Tuesday and remain undefeated. The match pitted two solid tennis teams in the undefeated Green Dragons (7-0) and Williamsport (5-2). Williamsport’s Tiarnan Ferry (No. 2) and Ty Jackson (No. 3) won in singles competition. Ferry beat Drew King in a close match, 7-6 (7-3), 6-4. Carter Casimir won at No. 1 singles, 6-4, 6-2, over Kevin Zheng. Wellsboro defeated a short-handed Galeton team, 7-0. Nathan Redell won at No. 1 singles 6-0, 6-3 over Joe Brelo. Luke Leach and Will Poirier won No. 1 doubles 1-6, 6-4, 6-2 over Brelo and Kyle Burrous. • In high school baseball, St. John Neumann struggled to find gaps in the CMVT defense and fell, 11-0, in five innings. Zach Derr and CMVT held the Knights to only two base runners while striking out two. • Loyalsock’s Rhiallie Jessell had four RBIs in Loyalsock’s 13-3 win over Milton in softball. Katie Welker and Bella Barone both had a home run for the Lancers. Caitlyn Guisewhite and Kacee Reitz both had a double. Emily Snyder had 10 strikeouts as Moontgomery defeated St. John Neumann, 15-4. Riley Fry was 2 for 4 with a triple, two runs and three RBIs. Juliana Kriner had a home run for Neumann and Anne Weller had a two-RBI triple. Jordan McCarthy’s walk off RBI double lifted Montoursville to a 7-6 win over Shikellamy. Madison Jean earned the win and had a double and a triple at the plate. Emily Hennigan led South Williamsport to an 11-1 win over Canton. Hennigan had eight strikeouts and was 2 for 3 with a home run, double, two runs and three RBIs. Sydney Bachman was 3 for 4 with a double a run and an RBI and Ashley Gardner was 2 for 3 with a triple, two RBIs and a run. • Josh Gose earned wins in the shot put and discus to help Lewisburg edge out Montoursville, 80-70, in boys track and field. Josh Dinges won the javelin for Montoursville with a throw of 196 feet, 11 inches, nearly 39 feet better than the second-place finisher. Jonah Isaacson won the 1,600 and 3,200 for Montoursville in 4:50.06 and 10:40.89, respectively. South Williamsport fell to Southern Columbia, 97-52. Port Habalar won the 800 with a time of 2:18.60, Jaiden Lynch ran a 23.80 for first in the 200 and AJ Flick won the high jump at 5 feet, 8 inches. Williamsport lost to Shikellamy, 84-66. Allen Taylor swept the 110 and 300 hurdles in 15.01 and 42.35, respectively. Keith Jason won both triple jump and high jump. • South Williamsport fell to Southern Columbia, 99-50, in girls track and field. Jaela House won the 1,600, 3,200 and was part of the Mounties’ 3,200 relay team with Elizabeth Manning, Josalyn Bradley and Addi Matz. Josalyn Bradly won the 800 in 2:40.4, and Alyssa Johsnon won the high jump at 4 feet, 6 inches. Williamsport lost to Shikellamy, 97-53. Kathryn Penman won the 100, 200 and 400. Hannah Lewis won the long jump and triple jump with jumps of 14 feet, 9 inches and 31 feet, 9 inches, respectively. Hannah Mirshahi won the 1,600 and 3,200 as Lewisburg defeated Montoursville, 94-56. Mirshahi ran a 5:45.33 in the 1,600 and 12:23 in the 3,200. The Green Dragons’ Kate Allred threw 112 feet, 10 inches to win the discus. Rebecca Reeder ran a 2:36.22 to win the 800 for Montoursville and Lauren O’Malley won the long jump, triple jump and javelin. • Garrett Huff scored three goals and dished out two assists but Lycoming fell at home to Stevenson, 21-9. Stevenson scored 14 goals to pull away in the middle two quarters. • In college golf, Bucknell finished 13th place at White Manor CC at the Wildcat Invitational. Connor O’Brien carded a 73 and Peter Bradbeer shot a 74 for the Bison. • In college baseball, Dominic Toso turned in another three-hit game and Tyler Wincig added a pair of hits, but Bucknell couldn’t defeat Towson, losing 10-3. 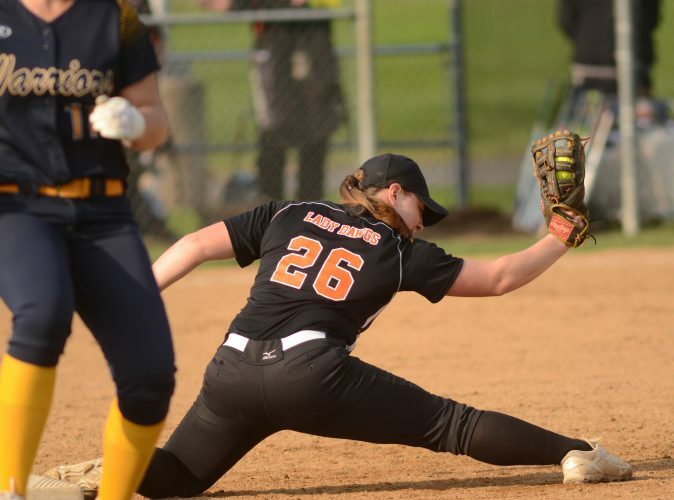 • Lycoming dropped doubleheader games at Alfred, 7-0 and 9-1, in college softball. Central Mountain grad Rachel Shady had a hit in each game. Ashley Shoenstadt had the lone run in game two for the Warriors. • Duc Dang provided the match-clinching point with a 7-5, 6-4 win at No 6 singles to lift Lycoming to a 5-4 win over Albright in men’s tennis. 1. Carter Casimir (L) def. Kevin Zheng, 6-4, 6-2; 2. Tiarnan Ferry (W) def. Drew King, 7-6 (7-3), 6-4; 3. Ty Jackson (W) def. AJ Swanson, 6-2, 6-2. 1. Peter Kinnamin/Chris Meng (L) def. Liam Ferry/Amani Tran, 6-1, 6-1; 2. Cole Temple/Sawyer Fisher (L) def. Ben Haussmann/Michael LeBlanc, 0-6, 6-3, 6-4. Records: Lewisburg (7-0, 6-0 HAC), Williamsport (5-2). Next match: Williamsport at Milton, Wednesday. 1. Nathan Redell (W) def. Joel Brelo, 6-0, 6-3. 2. Frankie Rexford (W) def. Kyle Burrous, 6-0, 6-0. 3. Noah Fitch (W) def. Tanner Hall, 6-1, 6-0. 4. Adam Cornell (W) won by default. 5. Zachary Lundgren (W) won by default. 1. Luke Leach/William Poirier (W) def. Joel Brelo/Kyle Burrous, 1-6, 6-4, 6-2. 2. Karsen Kennedy/Justin Wilcox (W) won by default. Kyle Ferguson and Adam Helminiak. Zach Derr and (n/a). W: Derr. L: Ferguson. Top Neumann hitters: Rivers Parrish 1-2; Brandon Loner 1-2. Records: CMVT (2-4), St. John Neumann (1-1). Next game: St. John Neumann at Montgomery, today, 4:30. Juliana Cruz and Rhiallie Jessell. Jillian East, Austin Swallow (5) and Kacee Wright. Top Loyalsock hitters: Jessell 3-4, 4 RBIs; Katie Welker 2-4, HR; Juliana Cruz 2-3; Summer McNulty 2-4; Bella Barone 1-4, HR. 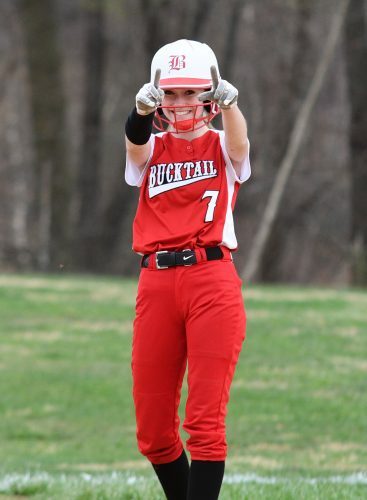 Top Milton hitters: Tiani Mowrer 2-3; Caitlyn Guisewhite, 2B; Kacee Reitz, 2B. Records: Loyalsock (5-2), Milton (0-2). Next game: Bloomsburg and Loyalsock, Thursday, 4:30; Milton at Danville, Thursday, 4:30. Top Montgomery hitters: Riley Fry 2-4, 3B, 2 runs, 3 RBIs; Sage Whipple 2-3, 3 runs; Emily Snyder 2-4, 2 runs; Abby Stryker 2-4, 2 runs. Top St. John Neumann hitters: Maria Helminiak 2-3, Anne Weller 1-2, 3B, 2 RBIs; Juliana Kriner 1-3, HR; Breanna Minnier 1-3, RBI. Long and Heller. Madison Jean, Mackenzie Weaver (5) and Jordan McCarthy. Top Shikellamy hitters: Lenner, 3 hits; Troupe, 2 hits; Kremer, 2 hits. Top Montoursville hitters: Jordan McCarthy, 3 hits 2 RBIs; Madison Jean, 2 hits; Faith Foster, 2 hits; Kaitlyn Klotz, hit, RBI. Jill Shay and Hannah Gilliland. Emily Hennigan and Ashley Gardner. Top Canton hitters: Gilliland 1-2, 2B, run; Vanessa Wesneski 1-2, RBI; Iroquoise Rols, 1-2. Top South hitters: Gardner 2-3, 3B, run 2 RBIs; Hennigan 2-3, HR, 2B, 2 runs, 3 RBIs; Sydney Bachman 3-4, 2B, run, RBI; Bella Bachaman 1-2, 3B, run. Records: South Williamsport (2-0). Next game: South Williamsport at Southern Columbia, Thursday, 4:30. 3,200 relay: Lewisburg, 9:11.48. 110H: 1. Will Dewald, M, n/a; 2. Logan Balourig, M, n/a; 3. Ian Plankenhorn, M, n/a. 100: 1. Maxwell Moyers, L, 11.84; 2. Will Dewald, M, 12.10; 3. Owen Foreman, L, 12:11. 1,600: Jonah Isaacson, M, 4:50.06; 2. Jason Stanko, L, 4:53.89; 3. Calvin Bailey, L, 4:56.44. 400 relay: Lewisburg, n/a. 400: 1. James Koconis, L, 51.20; 2. Felix Hernandez, L, 52.90; 3. Brayden Cost, M, 53.20. 300H: 1. Seth Griggs, M, 47.08; 2. Zach Bedell, L, 48.13; 3. Logan Bulouris, M, 49.91. 800: 1. Peter Lantz, L, 2:12.20; 2. Michael Hernandez, L, 2:14.33; 3. Clay Shaffer, L, 2:16.31. 200: 1. Dylan Farronato, L, 23.13; 2. Maxwell Moyers, L, 24.09; 3. Will Dewald, M, 25.03. 3,200: 1. Jonah Isaacson, M, 10:40.89; 2. Calvin Bailey, L, 10:50.49; 3. Evan Heart, L, n/a. 1,600 relay: Montoursville, n/a. Javelin: 1. Josh Dinges, M, 196-11; 2. Hayden Idom-Case, L, 158-0; 3. Gavin Livermore, M, 127-10. Long jump: 1. Tommy Bhangdia, L, 20-7; 2. Anthony Washington, M, 19-10; 3. Darren Baidoo, L, 19-8.75. Shot put: 1. Josh Gose, L, 46-11.5; 2. Michael Tiffin, L, 43-11; 3. Jake Reidy, M, 35-11.5. Triple jump: 1. Anthony Washington, M, 41-4; 2. Dominic Caputo, M, 38-6; 3. Collin Runyon, L, 35-0. Discus: 1. Josh Gose, L, 122-4; 2. Mike Tiffin, L, 120-7; 3. Keager Leachy, M, 100-5. High jump: 1. Dominic Caputo, M, 5-9; 2. A. Washington, M, 5-9; 3. Darren Baidoo, L, 5-3. Pole vault: Seth Griggs, M, 10-0; 2. Isaiah Griggs, M, 10-0; 3. Hunter Grimes, L, 10-0. 3200 relay: South Williamsport (Caleb Snyder, Evan Laudenslager, Riley Hockman, Tayge Molino), 9:37. 110 hurdles: Thomas Manley (SC), 15.9; Duncan Bedford (SC), 16.3; Christian Ryan (SC), 19.8. 100: Gaige Garcia (SC), 11.5; Jaiden Lynch (SW), 11.7; Gannon Guerrisky (SW), 12.2. 1600: Ethan Knoebel (SC), 4:44.2; Tayge Molino (SW), 4:47.4; Brady Reese (SC), 4:56.6. 400: Devin Blackburn (SC), 54.7; Caleb Snyder (SW), 58; Connery McFadden (SW), 1:00. 400 relay: South Williamsport (Tyler Trojan, Austin Nash, Jaiden Lynch, Gannon Guerrisky), 46.6. 300 hurdles: Thomas Manley (SC), 44.3; Duncan Bedford (SC), 47; Gavin Hunsinger (SW), 50.1. 800: Port Habalar (SW), 2:18.6; Cole Helwig (SC), 2:23.8; Aiden Trathen (SC), 2:29.1. 200: Jaiden Lynch (SW), 23.8; Damien Ares (SC), 25; Tyler Trojan (SW), 25.6. 3200: Ethan Knoebel (SC), 10:05.8; Tayge Molino (SW), 10:48.6; Evan Laudenslager (SW), 10:54.4. 1600 relay: Southern Columbia (Gaige Garcia, Damian Ares, Devin Blackburn, Ethan Knoebel), 3:47.7. Pole vault: Brant Long (SC), 12-0; Carter Scherer (SC), 9-6. Long jump: Stone Hollenbach (SC), 170-5.5; Tobias Walden (SC), 17-2.5; Devin Blackburn (SC), 17-1. Triple jump: Stone Hollenbach (SC), 36-9.5; Ethan Dunkleberger (SC), 36-8.5; Dalton Gough (SW), 36-6.25. Javelin: Nate Crowl (SC), 156-1; Stone Hollenbach (SC), 138-6; Curtis Anthony (SW), 119-8. Shot put: Troy Donlan (SC), 46-2; Jake Lusk (SW), 37-4.5; Rion Withers (SW), 34-6. Discus: Troy Donlan (SC), 107-1; John Stabinski (SC), 101-9; Jake Lusk (SW), 100. High jump: AJ Flick (SW), 5-8; Dalton Gouff (SW), 5-6; Tobias Walden (SC), 5-6. 3200 relay: Shikellamy, 8:57.67. 110 hurdles: Taylor (W), 15.01; Leib (S), 16.20; Williams (W), 16.79. 100: Tilford (S), 11.76; Colescott (S), 11.91; Potts (W), 12.02. 1600: Strouse (S), 4:41.86; Holcomb (W), 4:49.59; Dixon (S), 4:53.31. 400: Thompson (W), 52.58; Eiswerth (W), 55.11; Biichle (W), 55.46. 400 relay: Shikellamy, 44.18. 300 hurdles: Taylor (W), 42.35; Kline (S), 43.66; Castillo (S), 46.66. 800: Strouse (S), 2:00.74; Thompson (W), 2:07.94; Dixon (S), 2:11.71. 200: Folk (S), 23.76; Colescott (S), 24.34; Jason (W), 24.39. 3200: Hillman (S), 10:21.63; Holcomb (W), 10:23.73; Lyon (W), 10:41.87. 1600 relay: Williamsport, 3:36.18. Pole vault: Shaw (S), 13; Brubaker (S) 10-6; Cowder (S), 10. Long jump: Herring (S), 20-6; Jason (W), 20-2.25; Bilger (S), 20-0.5. Triple jump: Jason (W), 42-5.25; Taylor (W), 41-1; Bradley (W), 38-7. Javelin: Penman (W), 182-9; Krawkoskie (S), 179-1; Welch (W), 162-5. Shot put: Kreisher (W), 42-9.5; Tilford (S), 41-3; Moore (S), 41-2. Discus: Kerr (S), 116; Kelcick (S), 115-3.5; Kreisher (W), 111-9. High jump: Jason (W), 5-6; Hollenabch (S), 5-6; Moyer (S), 5-4. 3200 relay: South Williamsport (Elizabeth Manning, Jaela House, Josalyn Bradley, Addi Matz), 11:23.1. 100 hurdles: Kari Cambria (SC), 16.2; Alyssa Strocko (SC), 19.6; Autumn Chassie (SC), 19.9. 100: Madison Klock (SC), 13.1; Breonica Johnson (SC), 13.6; Julie Anthony (SC), 19.9. 1600: Jaela House (SW), 6:04; Tori Romania (SC), 6:13.5; Amilee Miller (SW), 6:33. 800: Josalyn Bradley (SW), 2:40.4; Maria Maresca (SC), 2:46.6; Amilee Miller (SW), 2:58.4. 400 relay: Southern Columbia (Maggie Morrison, Kari Cambria, Hanna Davis, Madison Klock), 53.1. 400: Hanna Davis (SC), 1:04; Elizabeth Manning (SW), 1:05.7; Monica Maresca (SC), 1:10.2. 200: Hanna Davis (SC), 26.9; Madison Klock (SC), 27.3; Gabby Lisi (SW), 28.9. 3200: Jaela House (SW), 13:16.9; Tori Romania (SC), 13:55.9; Adali Matz (SW), 14:46.9. 1600 relay: Southern Columbia (Monica Maresca, Maria Maresca, Karly Renn, Hanna Davis), 4:40.2. 300 hurdles: Kari Cambria (SC), 52.4; Kiersten Brecht (SC), 53.6; Lauren Rose (SC), 57.9. Pole vault: Karly Renn (SC), 7-6; Addison Sharrow (SC), 6-6. Long jump: Cassie Sharrow (SC), 13-7.25; Alyssa Johnson (SW), 13-6.5; Abby Halon (SC), 13-5. Triple jump: Cassie Sharrow (SC), 31-9; Abby Halon (SC), 30-3; Halle Cox (SC), 28-3.5. Javelin: Abby Hager (SC), 88-11; Julie Anthony (SW), 85-10; Cassie Sharrow (SC), 82-8. Shot put: Michelle Kerstetter (SC), 25-5; Chloe Dodge (SW), 21-9; Lily Sammerson (SW), 19-9. Discus: Kayla Hauer (SC), 79-8; Abby Hager (SC), 76; Chloe Dodge (SW), 68-1. High Jump: Alyssa Johnson (SW), 4-6; Christi Bennardi (SW), 4-4; Maggie Morrison (SC), 4-4. 3200 relay: Shikellamy, 10:47.16. 100 hurdles: Packer (S), 17.69; Goon (S), 18.05; Lake (W), 18.44. 100: Penman (W), 12.86; Kerstetter (S), 13.47; Swanger (S), 15.61. 1600: Keeley (S), 5:44.20; Smith (W), 5:38.90; Carper (S), 5:51.44. 800: Snyder (S), 2:34.83; Smith (W), 2:36.30; Keeley (S), 2:36.37. 400 relay: Shikellamy, 52.22. 400: Penman (W), 1:01.33; Young (S), 1:05.87; Radulski (W), 1:06.27. 200: Penman (W), 26.76; Kerstetter (S), 27.82; Snyder (S), 28.92. 3200: Keeley (S), 12:49.20; Carper (S), 13:12.82; McMahon (W), 13:17.19. 1600 relay: Shikellamy, 4:22.34. 300 hurdles: Packer (S), 53.36; Gadson (W), 54.6; Harry (S), 55.21. Pole vault: Carpenter (W), 8-3; Peifer (S), 8-0; Kratzer (S), 8-0. Long jump: Lewis (W), 14-9; Peifer (S), 14-5; Curry (S), 14-4.5. Triple jump: Lewis (W), 31-9; Curry (S), 30-10.75; Lake (W), 30-4. Javelin: Marinero (S), 119-3; Curry (S), 98-2; Doyle (S), 91-9. Shot put: Reitenbach (S), 32-11; Benner (S), 28-11; Robinson (W), 27-8. Discus: Little (W), 93; Rittenbach (S), 86-3; Kinlwy (W), 82-1. High Jump: Heckman (S), 4-10; Fisher (W), 4-10; Packer (S), 4-8. 3200 relay: Lewisburg, 11:16.54. 100 hurdles: Liz Fessler (L), 17.45; Katie Plankenhorn (M), 17.53; Anna Batkowski (L), 18.48. 100: Chloe Michaels (L), 13.38; Antone James (M), 13.72; Lydia Albert (M), 13.73. 1600: Hannah Mirshahi (L), 5:45.33; Delaney Humphrey (L), 5:47.83; Lauren Michaels (L), 6:09.27. 400 relay: Montoursville, 54.66. 400: Sarah Reif (L), 1:03.24; Chloe Michaels (L), 1:03.29; Tatayanna Kraft (M), 1:07.34. 300 hurdles: Anna Batkowski (L), 50.71; Katie Plankenhorn (M), 53.77; Lauren O’Malley (M), 55.21. 800: Rebecca Reeder (M), 2:36.22; Allison Reed (L), 2:38.17; Delaney Humphrey (L), 2:40.98. 200: Chloe Michaels (L), 27.81; Hannah Albert (M), 30.17; Erica Arnold (L), 30.19. 3200 Hannah Mirshahi (L), 12.23; Sarah Castellan (L), 13.09; Alexa Binney (L), 13.12. 1600 relay: Lewisburg, 4:22.20. Pole vault: Rebecca Roeder (M), 8-6; Becca Brown (L), 7-6; Scarlett Schroeder (L), 7-6. Long jump: Lauren O’Malley (M), 14-10; Haley Brown (M), 14-3; Tonie James (M), 14-1.5. Triple jump: Lauren O’Malley (M), 32-1.5; Liz Fessler (L), 28-6; Sylvie Yee (L), 28-0.5. Javelin: Lauren O’Malley (M), 93-8; Erin Hilkert (L), 85-7; Lauren Yost (L), 83-7. Shot put: Za’Imah Tutler (L), 31-10; Munayyah Meredith (L), 28-11; Kaitlyn Dawes (M), 27-1. Discus: Katie Allred (L), 112-10; Kaitlyn Dawes (M), 95-8; Sarah Beiler (L), 78-9. High jump: Erin Hilkert (L), 4-8; Katie Plankenhorn (M), 4-6; Nora Haynos (L), 4-4. Rachael Shady and Taylor Gessner. Wilcox and Krawczyk. W: Wilcox (7-3). L: Rachael Shady (2-8). Top Lycoming hitters: Rachael Shady 1-3. Top Alfred University hitters: Powers 3-4 HR 2 runs 2 RBI; Murray 2-3 3 RBI. Liz Nace and Lydia Yorks. Schaefer and Georgatos. W: Schaefer (7-3). L: Liz Nace (2-6). Top Lycoming hitters: Ashley Schoenstadt 2-3, run. Top Alfred University hitters: Powers 4-4, 2 runs, RBI; Ceja 3-4, run, 2 RBIs; Murray 2-3, 2 runs, RBI. Stevenson goals: JT Thelen (9), Chris Hammerquist (2), Ethan Christensen (2), Harrison Faecher (2), Kyle Karsian (2), Jacob Tatum (2), Collin Tucker (1), Gray McKee (1). Stevenson assists: Chris Hammerquist (3), JT Thelen (3), Ethan Christensen (2), Harrison Faecher (2), Kyle Karsian (2), Danny Buckwalter (1), Brandt Guldin (1), Jacob Tatum (1). Lycoming goals: Garrett Huff (3), Andrew Ream (2), Tyler Thompson (2), Drew Collins (1), Brandon Waden (1). Lycoming assists: Garrett Huff (2), Andrew Ream (1), Travis Rode (1), Tyler Thompson (1). Shots on goal: Stevenson 40, Lycoming 20. Saves: Stevenson (Sam Ross 11, Marc Poust 0) 11, Lycoming (Michael Tenant 17, Tim O’Connor 2) 19. Records: Lycoming (6-5, 2-2 MAC). 1. Dyland Okonski (A) def. Mitch Wheary, 6-2, 6-4. 2. Rob Smith (L) def. Noah Jessie, 6-4, 6-0. 3. Alhoun Lundy (L) def. Dylan Rutt, 6-0, 7-5. 4. Zach Schultheis (A) def. Zachary High, 7-6 (7-3), 6-0. 5. Pierre Joseph (A) def. Spencer Pedersen, 6-4, 7-5. 6. Duc Dang (L) def. Brody Brown, 7-5, 6-4. 1. Mitch Wheary/Rob Smith (L) def. Dyland Okonski/Zach Schultheis, 8-5. 2. Zachary High/Alhoun Lundy (L) def. Noah Jessie/Dylan Rutt, 8-4. 3. Brody Brown/Jalen Jett (A) def. Nick Meek/Duc Dang, 8-4.